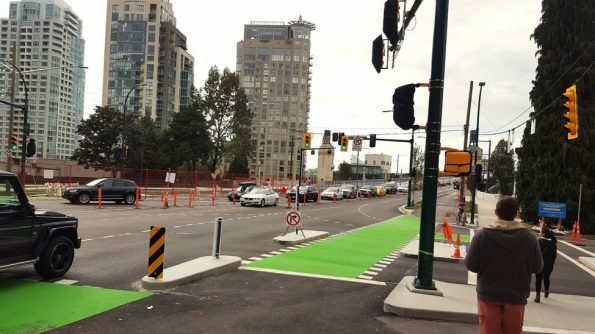 A $30 million roads, sewer, and bridge enhancement project by the City of Vancouver along the Burrard Street corridor is nearly complete. 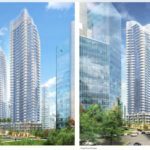 The project began in Spring 2016, and includes a wide range of improvements along Burrard Street from West 16 Avenue to Davie Street. 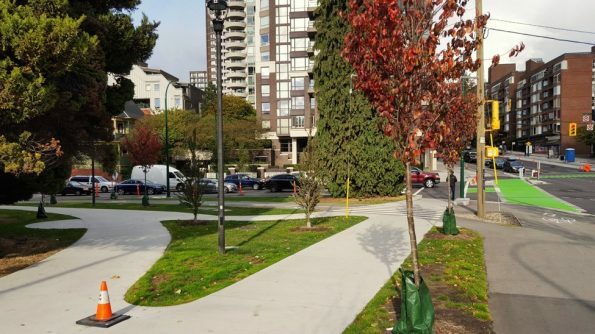 While the most time-consuming piece of the project was the replacement of critical water and sewer infrastructure along the route, Vancouverites will be most impacted by the many street level improvements that are now nearing completion. For vehicles, the centre of the bridge has been narrowed to four lanes, but will widen to six lanes at the northern end, where there will be two dedicated right turn lanes onto Pacific for northbound vehicles. This should prove to be a relief to drivers, as it is currently a major congestion point. Pedestrians will soon have full access to the eastern sidewalk, which was closed and reconfigured into the northbound bike lane in July 2009 by the City of Vancouver. Both sidewalks have been resurfaced to provide a smoother walking surface. 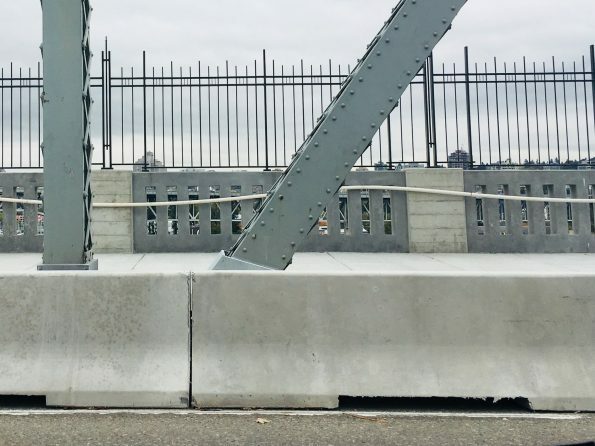 At the outset, one of the most controversial components of the project was the installation of a means-prevention, or suicide prevention fence along the length of the bridge. 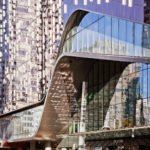 The fencing was criticized by NPA Councillor George Affleck, stating that “the aesthetics of the bridge will be compromised” with its installation. 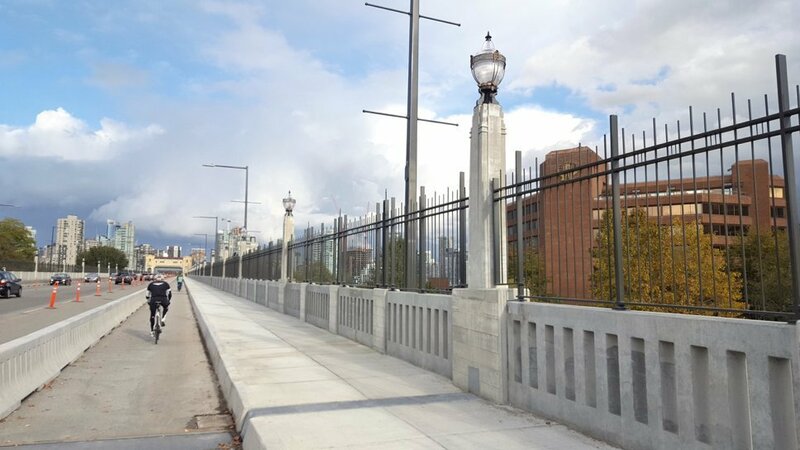 The fencing was designed, in collaboration with Heritage Vancouver, to complement the art deco style of the bridge, and features matching precast heritage lamp posts throughout its length. Cyclists stand to benefit the most from the one-and-half year project. 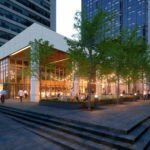 Upon its completion in late November, cyclists at the intersection of Burrard and Pacific will be fully separated from vehicles, providing clarity for all users of the space. This location was previously the intersection with the most reported cycling collisions in the entire city (according to the City of Vancouver’s Cycling Safety Study). 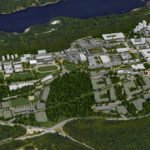 The reconfiguration should have a significant impact on safety. 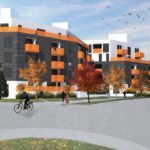 Cyclists will appreciate the more permanent, fully landscaped design along the entire project. 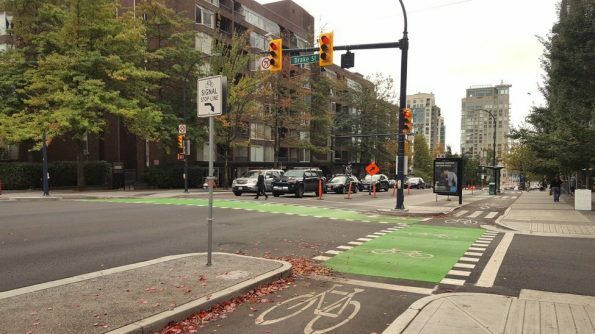 Instead of the concrete medians and planter boxes seen along many of the separated bike lanes in downtown Vancouver, the majority of the bike lanes will be at sidewalk level, separated from cars by a grassy median or a raised concrete curb, promoting a sense of safety among users. 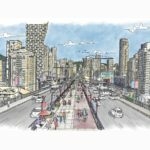 Improvements for cyclists and pedestrians along the Burrard Corridor. The intersection of Burrard and Drake is pictured. Improved sidewalks at Pacific and Burrard. The approach to the bridge at Pacific and Burrard, showing the separated bike lane and pedestrian crossing. 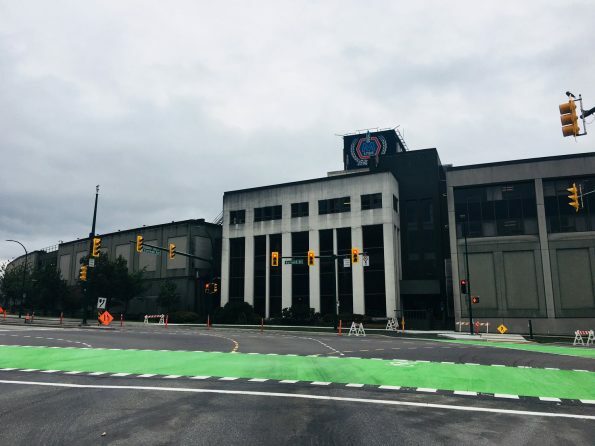 The intersection of Cornwall and Burrard has also been updated with new markings and a separated bike lane approach to the bridge in front of the Molson brewery. 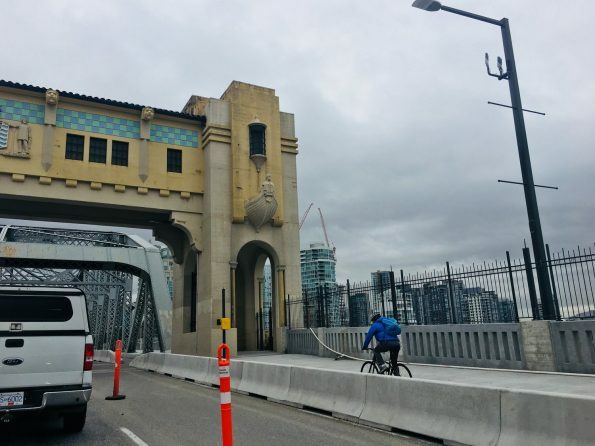 A cyclist uses the separated bike lane on the Burrard Street Bridge. Separated bike lane with sidewalk in background. The project is expected to increase the number of cyclist trips across the bridge. After the City improved the Burrard-Cornwall intersection at the south end of the bridge in 2014, cycling trips grew more than 25 per cent the following year.